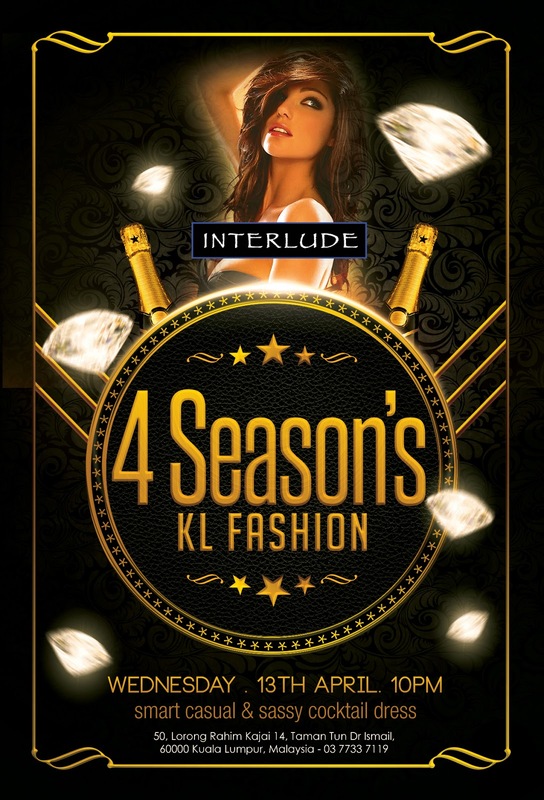 I am so glad to be invited to Interlude’s 4 Season’s KL Fashion. I am so excited and I would like to share the uniqueness of 4 Season’s KL Fashion with all of you. 4 Season’s KL Fashion will be launched on 13 April 2016, at Interlude TTDI. 4 Season’s KL Fashion is the brainchild of the founding members of Vessbroz and Interlude International Tapas Bar in TTDI. Its vision is to establish a platform for members of the fashion industry to display their work and talent on an ongoing celebration and appreciation of the KL fashion lifestyle. They believe that this event is like no other. From the launch date, there will be an ongoing display of fashion on a weekly basis set every Wednesday of the week at Interlude which begins at 10pm. Members of the fashion industry are it fashion designers, hair stylists to jewelers will be participating on a weekly basis to display their products and talent on our very own catwalk. The close proximity and relaxed environment allow guests and members of the industry to freely mingle and celebrate this amazing new concept. The name 4 Season’s was a natural choice as it's indicative of the event that run’s all year round. Their focus is to allow local talent to display their work to the public on an ongoing basis, this falls close to Interlude’s motto of emphasizing the use of local talent and produce. Interlude has been in operation for close to 3 years now and we are constantly in search of offering a unique experience to our customers and guests. The event consist of music by none other than Vessbroz a team of 2 brothers that will be playing Deep House and Chill out Music through the night. The presence of some local Artist’s and Celebrities will grace the night along with members of the media that will be covering the event on a weekly basis. There will also be reasonable selection of local and foreign models that will be ever present during this ongoing event. The main event will be the cat walk session when the models take center stage and display the artist's collection. This will be followed by the models mingling with the crowd to display the artistic creations by our very own local designers and artist’s. *This function will be ongoing every Wednesday with new designers participating. They will also have surprise give away for the best dressed. Also awards to be given out to best designer and model. 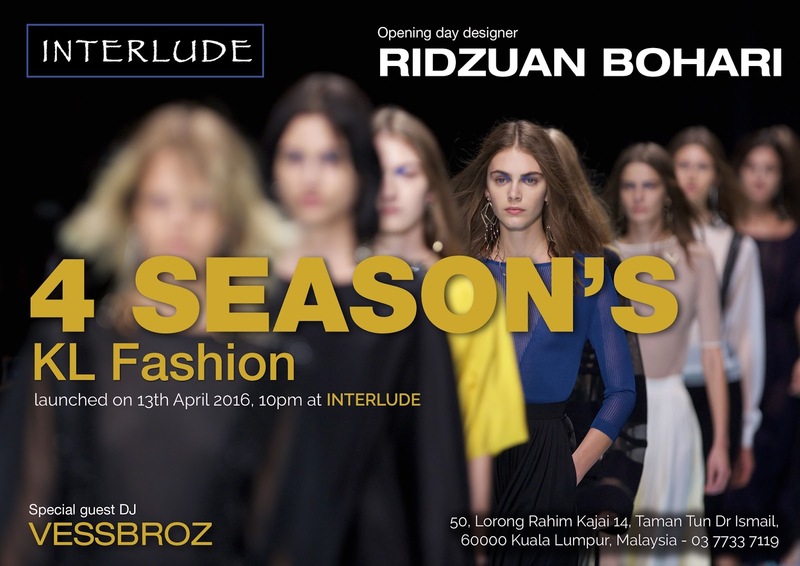 Fashion designer Ridzuan Bohari or well known as Ridz is a self- taught designer who discovered a flair for fashion and a distinctive sense of style Since 1989, Ridz has been pursuing his dreams with steadfast commitment and relentless determination. He never turned his back from what he started and loved, with a dedication to always aim high. His hard work and dedication finally paid off when he won the Piala Sri Endon [Sri Endon Trophy] awards, in recognition of his talents in Soft Furnishing Category . He was later invited by Tourism Malaysia to plan for the prestigious lifestyle event ‘Fashion & Interior in our Lifestyle’ held at Malaysia Tourist Complex. Shortly after that, Ridzuan hard work, passion and commitment of this artistry led to his appointment as the Show Producer of the acclaimed annual sale event, Malaysia Mega Sale Carnival, hosted by Shopping Malaysia. He was then engaged by TV 3 station to design and exclusive outfit for the presenter of the respected annual song competition, the Anugerah Juara Lagu 2005. After a few amazing seasons of great success in the fashion world, Ridzuan made another big step in his illustrious career by collaborating with YBhg. Datuk Tracy Ong, the founder of Elegance Club. With his great eye for detail and amazing grasp of fashion’s timeless, combination of old and new, he came up with Elegance’s exquisite pieces for his Lebaran and Ready to Wear Collection 2015. Ridzuan has a penchant for custom-designed fabric fan prints and hand painted batik in soft pink and seductive turquoise blue color, which have become his signature style. For all his collections, Ridzuan chose elegant and rich colors that created bliss harmony with whimsical graphics. It will easily find their way into any women’s heart with a mix of soft and strong silhouettes, evoking a sense of class with subtle allure. His collection is a dream for any woman of style, a must-have in the wardrobe’s wish list. We offer our valued clients the most recent collection, with an exclusive and extensive range of designs and a wonderful selection of great fabrics. His distinct beaded silk and chiffon batik collections worn by royalties, personalities and dignitaries including YAM Tuanku Zahirah, Tuanku Permaisuri Trengganu, Datuk Siti Nurhaliza, singer Datin Alyah, Noryn Aziz, Linda Jasmin, Rozita Che Wan among others. No 50, lorong Rahim Kajai 14, Taman Tun Dr Ismail, 60000 KL. Looks like a wonderful event. Usually there are many fashion events happening at local Miami event venues. Being a huge fashion freak, hardly miss any of those events. Even take my friends too with me to attend these shows.